Join us for a webinar to consider what counts as Personally Identifiable Information (PII) under the GDPR when it comes into force in 2018. The GDPR expands the definition of PII, but you need the full facts in order to plan properly. We will take you through the definitions you need, to show you where you need to change or adapt your data protection policies. 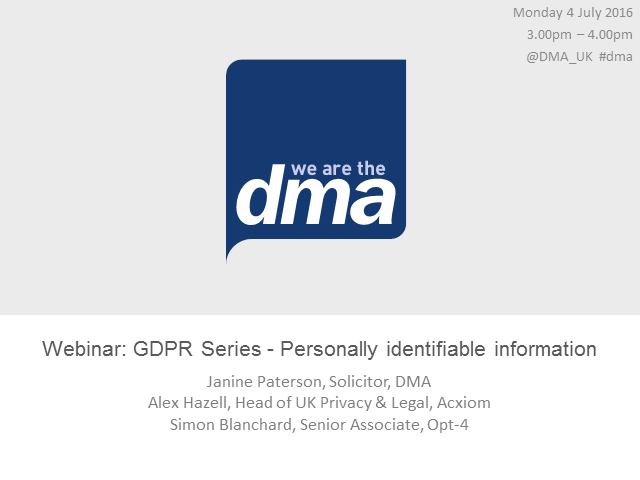 The panel will feature Janine, joined by Acxiom’s head of UK legal Alex Hazell and Opt-4 senior associate Simon Blanchard. The panel will be there to answer and discuss your questions on the day.